Something for the beginner quilter! 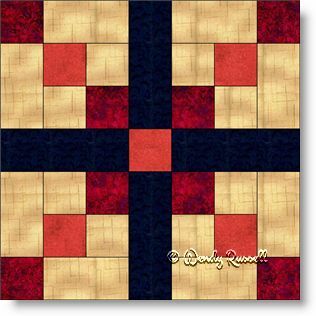 A quilt block designed using only squares and rectangles. This seven patch block will go together in no time as long as you are precise in sewing quarter inch seams. That is the only tricky part. The block is constructed as an uneven nine patch to make the production easier. The hardest part in this making this quilt block is choosing what colours to use! The two sample quilts illustrated use common settings of the blocks -- a side by side setting, separating the blocks with sashing strips and an on point layout with additional blank blocks to showcase your quilting stitches.